One of the things that I have always loved ever since I can remember is reading. It is amazing to sit down and just escape into a good book. There were always things that I missed on TV and in movies growing up due to my sight loss, but I never missed anything in the stories I read. When I was younger, I was able to read large print, but so many of the popular books that my peers were reading I could not get in large print. There was not a lot of access to audio or eBooks then either. Due to this, I did not read as much as I would have liked because those options did not exist yet. This issue also affected me in school because the books that we read in school were never in large print or audio. As a result, I had to have a teacher or teachers aid read them too me which made me feel singled out. I could read and I wanted to read independently. I remember being in grade nine or ten and thinking this is ridiculous. Why do I not have the same access to literature that the rest of the world does? I came across the issue of not having the same access to text books in university. Today this is still an issue as I want to take a course to gain some skills for my job but I can’t take the course because there is no accessible version of the text book. This makes me crazy that in this day and age we can make cars drive us around by a computer, but we can not provide everyone of every ability EQUAL ACCESS to print materials. I read a lot. I use audio books, eBooks, electronic Braille and print Braille. On more occasions than I can count, when I want to read the latest hot book I can’t because it is not produced in a format that I can access. There are more than three million Canadians across Canada that are living with a physical, visual or learning disability. The fact that only 2,000 of the 10,000 books being produced across Canada are in accessible formats is disappointing. 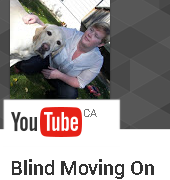 I find it even more upsetting that many of those titles are being produced by a charity, CNIB. A charity should not be faced with producing accessible materials, it should be something that is required by law and funded by the government. Access to literature is a basic human right, it is the only way that someone who is blind or partially sighted will have the same access to education and employment. If I told half of the people I knew that they could not read the things they needed to for work because the books were only produced in Braille and not in print that would never be accepted so why are we allowing it the other way around? I hope you are all well. I have been trying to write this post for a while now, in fact, I have sat down to write it about 3 times. I have been struggling with a comment that I keep running into, and the only way to change things is to bring them up and have those tough conversations. Education is key to change, and that is what I work for. The comment that I keep running into and have for a while is. “I really need to get out there and do x y z, if you can do it there really is no excuse why I can’t” I usually get these comments around things like snowboarding, golfing, making YouTube videos etc.. The thing that these things all have in common is that a lot of people do not think that it is possible for a blind person to do. In most cases, I am sure that people do not even realize what they are saying. When you make that statement you are saying “well since you are less than me, I should be able to do it with no problem and no excuses”. I want to inspire people to do things out of their comfort zone and push the barriers that we feel exist. However, I do not believe that I am less than anyone. I think that language is a very powerful thing and we need to be aware of what our words say in someone else’s head. We hear this comment a lot even in media, like the commercial where they show a bunch of athletes with disabilities doing things and it says at the end “what is your excuse”, now I am not a rocket scientist but how is that ok. Really take a moment and think about what that statement says about people with disabilities. How would that make you feel if that was you, and someone looked you in the eye and said that statement? It goes to the same thing when people say someone is inspirational for doing a mundane task like putting on makeup, getting dressed by themselves or taking the bus. These things are not inspirational at all. These are normal everyday tasks that we are more than capable of completing. I think the one thing that I want people to understand is that people with disabilities are equal on every level and your language can be very powerful in both a positive and a negative way.